Now is a great time to visit the Gulf Coast beach - Orange Beach weather is ideal while restaurants and hotels offer specials that make visiting the gulf coast this time of year inexpensive, uncrowded beaches and restaurants make a visit even more enjoyable. 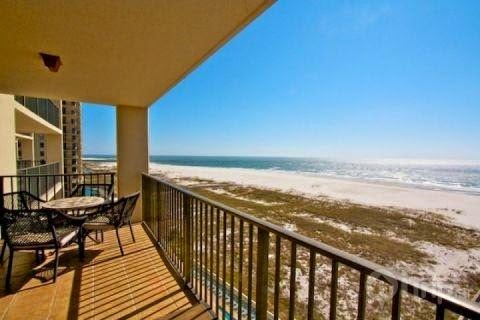 Located just before the Alabama Point Pass is Phoenix Condo Unit 807 - this Phoenix VI vacation rental condo is custom decorated, gulf-front, with one bedroom one bath. The kitchen is fully equipped with stainless steel appliances set in granite counter tops and custom cabinets. The unit is tiled throughout and includes a clothes-washer and dryer inside the unit for your use. The living room has flat screen 30" HDTV with DVD/VCR and sofa sleeper. The master bedroom has a king bed with a 25" HDTV and VCR. The dining area seats four, with two additional bar stools. The spacious balcony includes a table with four chairs and one lounger. High-speed internet access provided, additional amenities include: coffee maker, iron and board, laundry. Unit: Phoenix VI 1-BR, 1-BA beachfront condo!